I’ve been gushing about the Creative D200 for quite some time now on this site and it is only appropriate that I do a complete, in-depth review of these excellent Bluetooth speakers. Since I’ve already devoted plenty of reams to its smaller sibling – the D100, I’ll ignore it for now and focus entirely on the D200, which is among Creative’s best offerings in the wireless speaker space. Housed in a single, 19” long, sleek black case, the Creative D200 can certainly be given some points for its rather futuristic looks. At just 4.6lbs, this is a rather fleet footed Bluetooth speaker that is easy to toss into a car on a camping trip. Don’t mistake it for one of those ‘pocket’ speakers (a la Monster Clarity or Sound matters foxLv2) though, measuring 18.8 x 4.9 x 5.1 inches. The Creative D200 deserves full marks on this scale, since setting up the speakers is – to use a cliche – a breeze, provided you own a Bluetooth capable audio player. 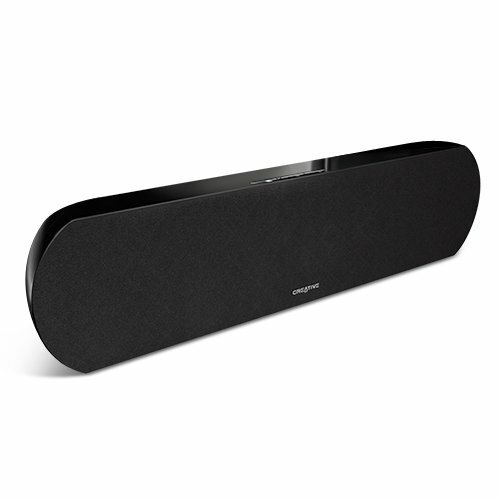 The speakers instantly recognize any Bluetooth enabled device and stream music within seconds. Perfect if you want to use these speakers with your iPhone or other Bluetooth capable phone/music player. If you don’t own a Bluetooth capable audio player, however, you can either use the built-in AUX port, or even shell out extra cash for a wireless Bluetooth adapter. The former, despite being more cost-effective, kills the entire purpose of using these speakers (wires!). The latter will set you back by almost $40, but is well worth the price if you plan to use a non-Bluetooth device as your primary music player. This is the most important battleground, the fields where speakers are vanquished or crowned kings and emperors. What good is a speaker, after all, if it can’t deliver pitch perfect audio, handle heavy bass, and deliver thick mid-tones without flailing (and failing)? The younger sibling – Creative D100 – has certain issues with bass heavy songs and doesn’t handle high tunes quite so effortlessly. Fortunately, the D200 doesn’t suffer from the same issues and delivers rich, deep bass and quite clear high tones. We hooked up our iPhone Touch filled with 32GB of music, and threw everything from Enrico Morricone and the Kill Bill soundtrack to Justin Bieber and Danger Mouse’s ‘Grey Album’ at it. We tried some Pavarotti, and even some Indian classical sitar music by Pandit Ravi Shankar. Justin Beiber and his ilk would be quite happy. Regular pop doesn’t really stretch the speakers and the D200 delivered a great performance. The Kill Bill soundtrack was rendered with admirable precision as well – not quite as good as our $600 Bose speakers, but impressive nonetheless. Pavarotti caused some problems, and the humming of the classical Indian sitar wasn’t quite clear at times. But these were more or less isolated cases and for regular use, the sound is more than adequately powerful and clear. At just around $100, the Creative D200 Bluetooth speakers are certainly very affordable. Despite the light weight, these speakers aren’t very portable on account of their large footprint. The design is clean and classic and will look good in any living room. The sound quality is solid, nothing more, nothing less. You won’t be blown away, but you wouldn’t want to climb into a corner with your ears stuffed with cotton wool either. Overall, for the price, these are a very ‘sensible’ pair of speakers (a word we don’t use very often). Setup is easy and the sound quality is above average. For $107, you’ll be hard pressed to find a more well-rounded set of wireless Bluetooth speakers than the Creative D200.